A few days ago I have discover a virus that spread using common known media, USB Flash disk. This virus seem to be the same as other malware and it was compressed with PECompact utilities. The worm itself has been written using Microsoft Visual Basic 6.0. This worm is commonly known as W32/Autorun.worm!n (McAfee), TR/Crypt.PEPM.Gen (Avira), Win32.Worm.VB.NXY (BitDefender). The worm altering Windows registry as a startup point everytime Windows load. The worm seem to overwrite a %systemroot%\system32\drivers\etc\hosts file and set every unwanted domain name to pointing to localhost (127.0.0.1) IP. Most of the listing are computer security website including antivirus, firewall and download site. The worm also contain some DDoS attack code which will send a random packet to the target. This virus has been created by people who was new to the programming especially Visual Basic 6. 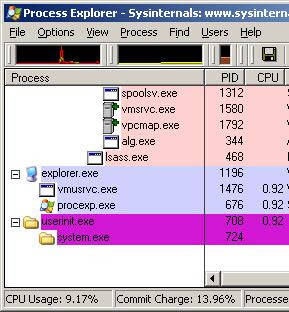 Take a look some of their codes, it uses many timer to use their malicious function thus, making this worm unstable and taking alot of CPU usages. Here it is some extracted string from the compiled Executable file. VDEF updates for Portable Antivirus is available to download. W32.virut is a parasitic file infector, polymorphic & backdoor capabilities.Once it has been executed it will inject its code into winlogon.exe process and crate a new thread in that process. Any execution from the infected file will run the viral code first before passing to host code. W32.virut prevent its execution from running on virtual Machine such as VMWare & make it difficult to trace its presence, thread and processes.